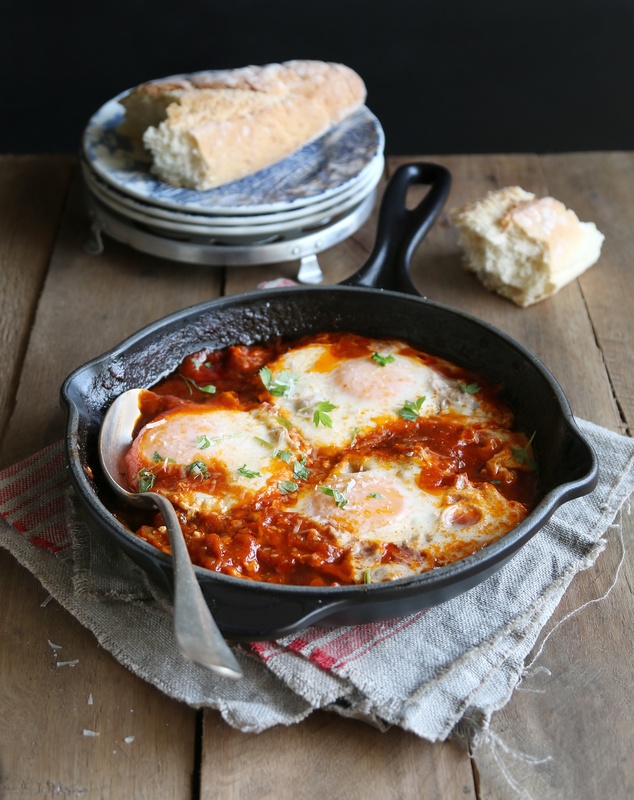 A North African dish of savory eggs poached in a pepper tomato sauce. Saute onions and mushrooms and salt until golden Add peppers and saute till tender Add spices and saute 2 minutes until infused Add tomato sauce and water and cook slowly 10 min Make a small well in the sauce for each egg. Individually Crack eggs into a small bowl and the transfer to each well without breaking yolks Cover and cook until eggs are poached. Sprinkle with cheese and cilantro, drizzle with olive oil Add sauce to bowls and top with egg. Drizzle a little extra oil and serve with toast..